This is #9 in Sub Rosa's limited edition Framework series -- an extension of their Concrete Electronics Noise series. Erdem Helvacıoğlu was born in Bursa, Turkey in 1975. He is one of the most renowned "contemporary electronic music" composers of his generation in Turkey. His music has been broadcast on national radios such as BBC, ABC, WDR and Radio France, among others. He has received commissions from the 2006 World Soccer Championship, T-B A21 The Morning Line, Borusan Center For Culture & Arts, Arter "Space For Art," The Association For The Art Of The Harp, Novelum Contemporary Music Festival, International Istanbul Biennial (IKSV) and the world-famous new music ensemble Bang On A Can-All Stars. 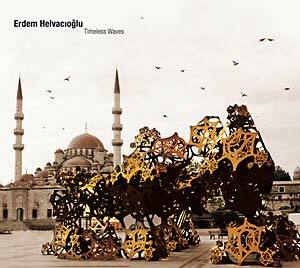 His sound installations have been included at museums and galleries such as the 10th International Istanbul Biennial, Los Angeles Track 16, Indonesia Soemardja, Köln Museum Für Angewandte Kunst and London's Menier Gallery. His film music has been heard at Cannes, Sarajevo, Locarno, Seoul, São Paulo, and Sydney film festivals and he received the "Best Original Soundtrack" award in the 2006 Mostramundo Film Festival. He has received prizes for his electroacoustic compositions from the Luigi Russolo, MUSICA NOVA and Insulae Electronicae Electroacoustic Music Competitions. Timeless Waves, originally composed for a 47 channel/53 speaker diffusion system running on The Morning Line, is a sonic work based on six basic human emotions. The CD is a stereo version of this multichannel work. The piece was inspired by W. Gerrod Parrott's book Emotions In Social Psychology and has been commissioned by Thyssen-Bornemisza Art Contemporary (T-B A21) for The Morning Line -- an interdisciplinary art project by Matthew Ritchie, Aranda/Lasch and Arup AGU -- and premiered in May 2010, when the project was exhibited at Eminonu Square in Istanbul. Sonically, Timeless Waves is based on the timbres of Togaman GuitarViol, Gibson Les Paul electric guitar, sine waves, various analog pedals and hardware fx processors. The music combines elements from genres such as electroacoustic, drone, noise and contemporary music blended with minimal melodies. Cover photo by Jakob Polacsek.